ÿÿÿÿÿ This week’s photo comes from freelance photographer Casey Davis. A resident of southern California, Casey is an aspiring professional photographer. From the look of this photo of Michael Leib at Rynoland, Davis is well on his way to his dream. To check out more of Casey’s photos,ÿclick here. WEATHER MAN: SUNNY IN SEATTLE? ÿÿÿÿÿ Traditionally the Seattle Supercross is a quagmire, but the weather is looking rather sunny for Saturday in Washington. Although the weatherman still has a few days to change his outlook, above is what Weather.compredicts for the forecast this weekend. “Mostly cloudy with a high of 62 degrees and only a 20% chance of showers.” However, Friday and Saturday call for rain. Keep your fingers crossed and pray for sun in Seattle (unless you’re Kevin Windham, “Mr. Swamp Master”). ÿÿÿÿÿ There was a very familiar face at Glen Helen this past week. “Iron” Mike LaRocco was out spinning laps around the track on a CRF450. Upon closer inspection, he was riding Daniel Reardon’s outdoor bike. Does he plan on returning to professional racing? What has he been doing with his retirement? All questions that needed asking. Mike LaRocco has been a staple in the racing world. In the last few years of his career he opted for skipping the outdoors, instead racing Supercross, but he always found greater success on the natural terrain outdoor tracks. MXA: What are you doing here at Glen Helen? Mike: I came out with the Geico/Honda team. We had a pre outdoor testing for the last couple of days, and today I came out with Factory Connection to hang out with them and ride Daniel Reardon’s bike. They wanted to get my opinion on the bike. MXA: How does it feel being back on a motocross bike after some time off? Mike: Obviously I’m heavy, rusty and awkward. Considering how long I have been away from racing, the bike felt pretty good. I had some suggestions and we made a few tweaks, but it was pretty easy to ride. I liked how easy it was to turn, and I really liked the powerband. I’ve been hearing a mixed bag of things about the bike, but in the aftermarket form it feels pretty good. MXA: I have an obligation to my job to ask you the obvious question. Are you going to race any Nationals this year? Mike: No. I’m too far gone [laughter]. I would probably have to train just to get back to the amateur level. MXA: You’re being too hard on yourself. What about racing Red Bud? Being your hometown track, I’m sure that a ton of fans would come and support you. Mike: Nah. I’m just going to keep trying to ride so that when the Geico/Honda team comes out to my place this summer I can go and ride with them. There’s no reason for me to put a few hard months of riding and training in for one race. Mike: It’s good, but it’s actually pretty tough for me. My wife and I have two little kids that are very active, and my wife opened up a baby boutique. She has been giving that a lot of attention, and I’ve been getting the kids. It’s a big role change, and while it’s great, it’s also hard! I really don’t have much free time. 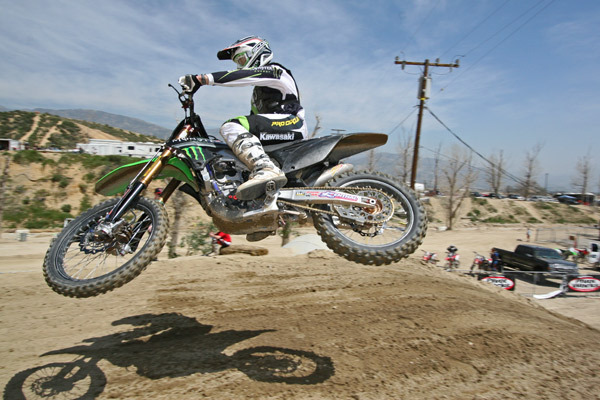 MXA: Do you find that you are busier now than you were when you raced full-time? Mike: Yeah, when I raced I knew that I didn’t have much time other than to take care of what needed to be taken care of. Now I feel like I have time, but then I open up all these cans of worms and I can’t complete anything. The kids are getting easier and we moved, so now I’m getting a little more free time. MXA: Coming down to the wire in the fight for the Supercross title, who do you have your money on? Mike: It’s actually going to be very interesting. I feel like Reed is the one that is going to make James win it or lose it, but the championship is in Stewart’s hands. James has to win, but he also can’t make any mistakes. It’s going to be interesting. MXA: Do you have any interesting plans for the summer? Mike: Not really. I’m going to be a little more involved with the team and have fun. ÿÿÿÿÿ It has been 8-1/2 weeks since Ryan Dungey and Jake Weimer raced against one another, but the chase for the 250 West Supercross title is heating up once again. Only two points separate the duo as the series heads to Seattle for the second-to-last West coast round. To put things into perspective, here is an outline of statistics between the two riders. 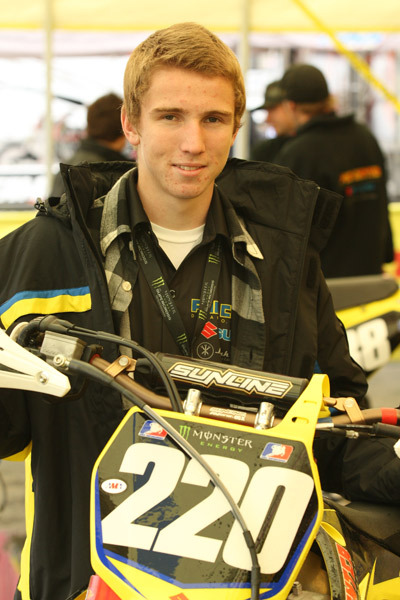 …Jake Weimer? Only two points separate the riders. Dungey and Weimer’s results nearly mirror each other (both have finished first place three times and fourth once). The difference? At one race Dungey finished second, while at another race Weimer finished third. Hence, the two point lead for Ryan Dungey. Neither rider has won a Supercross title before. Each rider has won three main event races this season. The last time Suzuki won a 250 crown was back in 2003 with Branden Jesseman (East coast). Back then the class was designated as the 125 class. The last time Pro Circuit/Kawasaki won a 250 crown was 2-1/2 weeks ago with Christophe Pourcel (East coast). The ink in the AMA record book is still drying. Robbie Maddison will be one of a select few Red Bull riders on “Good Morning America” in the coming weeks. ÿÿÿÿÿ We just received word that freestyle riders Drake McElroy, Ronnie Renner, Robbie Maddison, Lance Coury, Levi Sherwood, Jack Rowe and Mat Rebeaud will be riding for the television cameras of “Good Morning America.” The Red Bull riders will be featured in the ?Weekend Adventure’ portion of the daily ABC show. The fleet of riders plan on riding in the Glamis sand dunes and the feature should air within the next month. We’ll keep you updated on the exact date that the feature will be shown on televisions around the country. ÿÿÿÿÿ Every year at the beginning of April a contingent of motocross industry people and general sand dune diehards come together for a weekend of fun and adventure. Coined as a guy’s only trip, creator Danny Dobey from One Industries and his crew of friends have been making the annual trip for five years now. After Danny helped throw the new gear introduction (that we covered in the February 2009 issue of MXA) and saw how excited I was when, in the Superstition Mountains, we came to the sand portion of the ride, he decided to invite me to Glamis. ÿÿÿÿÿ Although I decided to forego racing at REM for the opportunity to ride in Glamis, my decision to skip racing that weekend was a good one. Along with MXA’s Assistant Editor John Minert, we buried our bikes in sand and went free riding until our hearts were content. We even found a few jumps to hit. While they paled in comparison to what the freestyle motocross riders hit, it was still a rush to point our KX450Fs at the lips of sand dunes, shift to fourth gear, and twist the throttle wide open. If you’re riding in Glamis there’s no escaping the fact that you will need to put on a paddle tire for proper traction in the sand. (1) Make sure that you install a paddle tire. I used an eight-cup paddle tire, and it worked great. Many thanks to Mark Hall and Willy Musgrave at MTA for hooking me and John Minert up with paddles. (2) Forget what people say about how difficult it is to install a paddle tire. Minert and I both found that it was much easier to install a paddle tire than a conventional knobby tire. Don’t fear when it comes to staring down a paddle tire on a naked rim. (3) Paddle tires require more room between the axle and the wishbone of the swingarm. Make sure that you have an extra chain with more links so that you can swap chains and move the axle back far enough to clear the cross section of the swingarm. Also, you should remove the mud flap, because it will get rubbed down to nothing thanks to the paddles. (4) Whips are mandatory for dune riding at Glamis. Do they look dorky? Absolutely. Do they come in handy for seeing other riders around you? Yes. In a battle between looks and safety, safety should always win out. Not mentioned in the list is that you need to bring several extra fresh air filters. Change regularly! (5) When camping in the desert, it’s best to bring a trailer with you for shade, coverage against the wind, and for sleeping quarters. Minert and I took a Toyota Tundra. You could say that we roughed it a little bit, which is good for a day, but for a weekend it gets a little rough. (6) Peak season for riding at Glamis is between the very end of October until the middle of April (now). Otherwise you’ll be fried in the summer sun. (7) It seemed that most people riding at Glamis, at least when we went, didn’t know what proper riding equipment was. In place of pants, jerseys, chest protectors and boots were shorts, t-shirts, and tennis shoes. Dress for the crash, people! 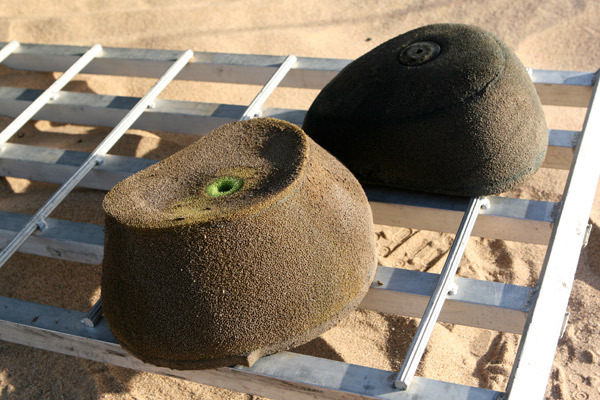 (8) And finally, don’t get too cocky about your dune riding skills. I nearly stuck my head in the sand after misjudging a sand dune and jumping too far, while John Minert didn’t read the terrain quite right on another occasion and went over the bars. And then there was Roland Sans, who happened to be camping near us. He decided to jump his Ford nearly ten feet in the air off a dune, and when he came down both of his front rims shattered on impact. It was great to watch, but not good for Roland. Available in “Standard” & “Pro” model with integrated Hot Start lever. ÿÿÿÿÿ Tyla Rattray is the newest recruit to Mitch Payton’s powerful Monster Energy/Pro Circuit Kawasaki team. The 2008 MX2 GP champion will contest the 2009 Lucas Oil/AMA 250 Nationals, and if practice means anything, Rattray is looking extremely promising. South Africa’s Tyla Rattray has been putting in plenty of testing time in preparation for the 250 Nationals. MXA: Tyla, what is the best thing about the U.S.? Tyla: I really enjoy the weather. I am used to staying in Belgium, but we had a lot of rain and cold months there. To come to America and have sunshine every day is great. MXA: How is it adapting to the Kawasaki after being on a KTM for several years? Tyla: I’ve adapted pretty quickly to the Kawasaki. Mitch [Payton] has a really great bike, as everyone knows. They won the East championship and they’re fighting for the West in Supercross. I definitely know that it’s the best bike. I’ve been doing a lot of riding and testing. Things have been going well and I believe that I have really adapted well to it. I can’t wait to race the bike in the summer. MXA: How difficult are the testing sessions that you do? Tyla: With testing you have to expect that you’re going to be at the track all day long. Sometimes I get to the track at about 11 a.m. and I don’t leave until 6 or 7 at night. We test everything that you can possibly test on a bike. It’s really good to test because you get to find out exactly what you like. I need to have a good feeling on the bike, and at the end of the day testing is worth it. Hopefully I can win the championship and I will reflect back and know that spending those extra hours testing was worth it. MXA: Have you had the opportunity to spend any time in other parts of the U.S.? Tyla: Aside from Indianapolis for the motorcycle dealer trade show, I’ve only been to California. I came over in 2006 to race the Millville National in Minnesota, but that’s about it. I’m looking forward to traveling to all of the Nationals this year. MXA: How did you do when you raced at Millville? Tyla: Everything was going okay, but then my bike seized going through the whoops and I dislocated my shoulder. It happened on Sunday morning and that was the end of the weekend for me. Regardless, I really liked the track and I was looking forward to racing. Rattray has only raced in America one time before. He had the speed to contend at the Millville National in 2006, but a trip over the bars ruined his shot at racing. MXA: Are you familiar with any of the National tracks? Tyla: I’m going to go into the series blindfolded. I’ve only been to Millville and Glen Helen. I’ve only watched the races on television, but I plan on taking early flights on Friday to get to the track and walk around it. MXA: What are your expectations for this year? The X-Fighters will be making a stop in the Fort Worth Stockyards for a second year in a row. Photo credit Garth Milan. ÿÿÿÿÿ FORT WORTH, Texas ? Red Bull X-Fighters, the world’s premier, most-progressive freestyle motocross series will return to the Historic Fort Worth Stockyards in Texas on Saturday, June 27. Last year more than 20,000 fans, plus an estimated 20,000 more outside the venue, witnessed as 12 snarling motorcycles temporarily replaced stampeding Texas Longhorns in the first-ever Red Bull X-Fighters stop in America. Swiss superstar Mat Rebeaud captured the Texas event with an exhilarating final run on his way to the overall series championship, and he looks to fend off the challenges of his traditional rivals and a young upstart to repeat his success in 2009.
ÿÿÿÿÿ The world’s best riders will take on the challenges of a massive, Texas-sized course, providing them with several ways to impress the judges and thrill the crowd in their runs. The winner will receive the trophy, garner the accolades and score 100 points towards the Red Bull X-Fighters World Tour series championship. ÿÿÿÿÿ In addition to Rebeaud, the 12-rider lineup includes series regulars Robbie Maddison (Australia), Dany Torres (Spain), Jeremy Stenberg (USA), Eigo Sato (Japan), Thomas Pags (France), Andre Villa (Norway) and 17-year-old Kiwi wunderkind, and winner of the Mexico City stop, Levi Sherwood. The final four riders will be named as the event draws closer. Switzerland rider Mat Rebeaud won the X-Fighters competition in Texas last year. Photo credit: Flo Hagena. 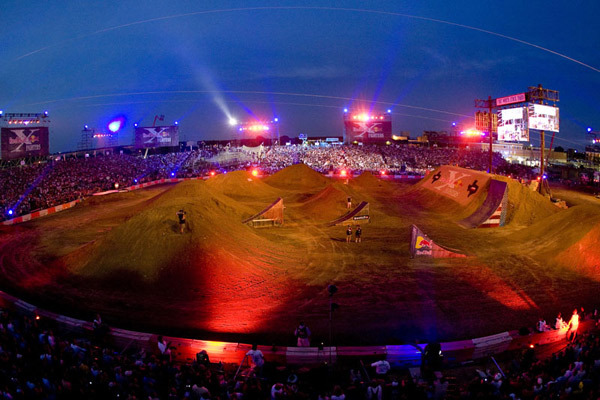 ÿÿÿÿÿ The Fort Worth stop is the third of five international Red Bull X-Fighters events in 2009, starting with the traditional MUC-OFF at the 45,000-seat Monumental Plaza de Toros in Mexico City. Calgary hosts Canada’s first Red Bull X-Fighters on May 30 at the Calgary Stampede, followed by Texas. The Las Ventas bullring in Madrid will enjoy its eighth-consecutive year with a stop on July 16-17, and the series wraps up with a visit to London on August 22.
ÿÿÿÿÿ Red Bull X-Fighters was created in 2001, debuting in Valencia, Spain at the bullring where the legendary ?Mad’ Mike Jones claimed victory. Since that historic night, Red Bull X-Fighters events have taken place in the world’s most iconic locations, including the famous bullrings in Madrid and Mexico City, Slane Castle in Ireland, the Sambodromo in Rio de Janeiro, a massive stone quarry in Wuppertal, Germany and the Stadion X-Lecia in Warsaw, Poland. ÿÿÿÿÿ Tickets will go on sale to the public in May, with further information coming shortly. ÿÿÿÿÿ You might not know who Gregg Godfrey is, but it’s assured that you know of his show. Paired with Travis Pastrana, Gregg is the producer and creator of “Nitro Circus,” a weekly show that airs on MTV. If you haven’t seen “Nitro Circus,” be sure to tune in to MTV Sunday nights at 10 p.m. After hearing about Gregg’s success with the show, I wanted to hear how life has changed for Godfrey. Gregg Godfrey has been around for all of Travis Pastrana’s crazy antics, like skydiving without a parachute. Photo credit: Godfrey Entertainment. MXA: Gregg, is it true that there will be a second season of “Nitro Circus” on MTV? Gregg: Yeah, we just signed for the next season, so we start filming in two or three weeks. There will be nine new episodes, which will give us a total of 23 episodes for one year, which is great. I don’t think we will be able to survive a third season though, because there won’t be anyone left! MXA: What is the most difficult part about creating the show? Gregg: The hardest thing is that there are so many chiefs. There are different visions. I have a certain strategy when it comes to making the show, but there are other influences in the show as well. I try to keep things kid friendly, because that’s such a big thing about our show. I try to stay to our standards, and sometimes I have to put my foot down. Thank goodness Travis is on the same page that I’m on; otherwise it would be a really bad fight between the two of us. MXA: You work with several different people when producing the show, most notably Johnny Knoxville. Gregg: He is an extremely creative and smart guy, just like Jeff Tremaine. Johnny is the full package and he reminds me of a living cartoon. He’s just like Travis, only Johnny has zero skill and Travis has a ton. Going back to what is the most difficult part of the show, I think it might actually be involving Andy Bell. The guy has a problem keeping his clothes on. I think that he and Chris Pontius are brothers from a different time. They should both be living in a nudist colony. Johnny Knoxville is one of the instrumental people behind “Nitro Circus.” Sometimes he even steps in front of the camera, usually with a painful but funny ending. Photo credit: Godfrey Entertainment. MXA: Oh boy. Switching subjects quite a bit, can you provide a glimpse into locations that you plan on going to for next season? Gregg: We don’t have a monster budget. You have to be conservative and creative at the same time, so we stick to our resources. We’re planning on doing one episode in North Carolina with several NASCAR drivers. It’s really cool because they reached out to us. We have also been talking about doing a reverse BASE jump out of the old Texas Stadium. Basically we want to make a slingshot from the roof of the building and extending down to the 50 yard line on the football field. From there we want to shoot guys through the opening in the roof and have them BASE jump out. We’re not sure yet if that will even happen. MXA: I have to give you credit on your show, not just for bringing motocross and freestyle motocross into the public eye, but also for keeping the show clean for young kids. Gregg: Thank you. I have so many mothers and kids that come up and thank me for making a good show. That’s what it’s all about. 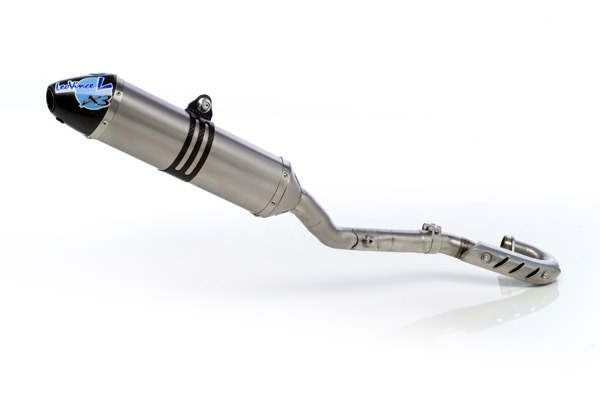 ÿÿÿÿÿ Richmond, CA- LeoVince X3 94db Stainless Steel systems are now available in the U.S. market for all 2009 motocross machines and most 2008 models. These systems provide significant horsepower increases and still meet the new AMA 94dB limit. ÿÿÿÿÿ LeoVince has vast experience with producing high-powered systems with low sound output. Our 94dB Ti race system was used by Team Yamaha’s Antonio Cairoli to win the 2007 FIM MX2 World Championship. We have also won five World Enduro championships with 94dB systems. ÿÿÿÿÿ X3 stainless steel systems are available as a full system, silencer only or header only. All are designed to fit easily with the stock components so you can add one piece at a time as needed. All are constructed with high-grade stainless steel for durability and value. The silencer features a carbon fiber end cap and mounting strap. Our DuraPaq? packing material is designed to last 50 hours before repacking, even under severe racing conditions. Every X3 system is also supplied with the correct springs, spring puller, wash plug and a removable spark arrestor as part of the package. ÿÿÿÿÿ All LeoVince X3 systems are the result of our experience acquired on world-class competition circuits. LeoVince supports teams competing in MotoGP, World Superbike and Supersport, MX1 and MX2 Motocross, World Enduro and Supermoto. LeoVince’s commitment to racing in the U.S. includes teams in AMA Superbike, Formula Extreme, Supercross, Outdoor MX, Supermoto and Grand National Flat Track. LeoVince is a division of Sito Gruppo Industriale based in Monticello d’Alba, Italy. Sito is the largest exhaust manufacturer in Europe. LeoVince USA brands include SBK for sportbikes, Silvertail for cruisers, Scoot for scooters, X3 for off-road and ATVs and Sito for low-cost OEM replacement. For more information visit LeoVinceUSA.com. LeoVince products are distributed to U.S. motorcycle dealers by Parts Unlimited, Tucker-Rocky and Western Power Sports. ÿÿÿÿÿ For more information, visit www.leovinceusa.com or call (888) 610-4242. 1) Removes one item completely off the handlebars making handlebar replacement easier/faster. 2) Creates more room for hand guards, lap timers. 3) Can be placed on clutch or brake side allowing all aftermarket clutch levers assembliesÿÿÿÿ to still be used. 4) No parts fall on the ground upon removal (typical Honda kill switch). 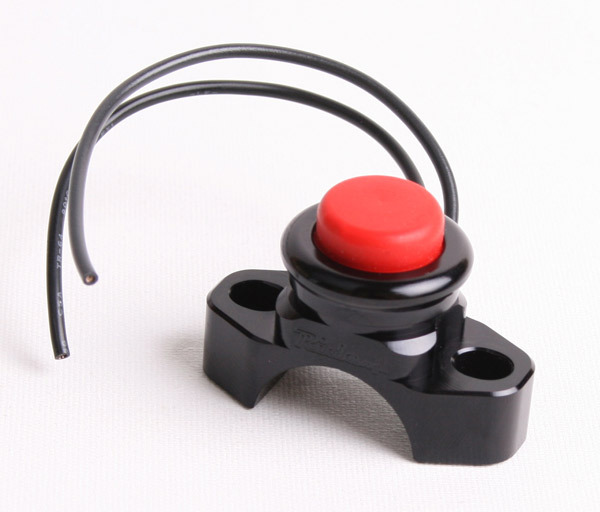 5) Can also be used as a starter switch on CRX/WR/KLX/KTM electric start dirt bikes. Contact: www.ride-engineering.com or call (800) 805-1516.
ÿÿÿÿÿ Ketchum, ID – For the second year in a row, Smith Optics has been recognized in a nationwide search for America’s best places to work.ÿ Today Smithÿ was named to Outside magazine’s second annual “Best Places to Work” list, ranked No. 4 out of 30 selected companies.ÿ The full list and related story will be published in the May issue of Outside magazine, available on newsstands April 14, 2009.ÿÿ With its amazing work environment, employee benefits, management style, and world class recreational opportunities, Smith’s ranking is yet more evidence that the company has much to be proud of and a one of a kind heritage. ÿÿÿÿÿ “This is a company passionate not only about the products we make, but the sports we make them for.ÿÿ This recognition is not surprising, but it is very rewarding and an important validation of the efforts we all make here together.ÿÿ I could not be more proud of the employees of this company and this award sincerely belongs to them,” said Smith Optics president, Ned Post. ÿÿÿÿÿ It comes as no surprise that Smith Optics was selected and ranked so highly in this competition.ÿ This is something that everyone at Smith can be proud of and know that even in the times of an economic roller coaster that they work for an employer who has their back and best interests at heart.ÿ Congratulations to everyone at Smith Optics! Can Cole crack the top eight in Seattle? We think so.